As I wrote earlier, if one wishes to understand icons, one must learn to read them — at least the basic and most common inscriptions. This must seem a tremendous task to the beginner, but that is a serious misconception. Learning to read common icon inscriptions is actually very easy precisely because they are so common. That means they are also very repetitive, so a little study gives great rewards far out of proportion to the little effort involved. There are essentially two languages used in most icon inscriptions one is likely to encounter: First, Church Slavic on Russian icons; second, Greek on Greek icons. Church Slavic traditionally holds the place in the Russian Orthodoxy that Latin formerly held in Roman Catholicism: it is a language used in “Church” matters, but not the same language people speak in their everyday lives. So in traditional Russian Orthodoxy, Church Slavic is the language used both in the rites of the Russian Church and in inscribing icons. It is important to note that it is neither what is called Old Slavonic, nor is it modern Russian, but rather something between the two. A modern Russian can understand it only with some difficulty, which is why many Russians have trouble reading a Bible written in Church Slavic, but no trouble reading one written in modern Russian. The Greek language traditionally used in inscribing Greek icons is an old form like that of the New Testament manuscripts. Modern Greek is somewhat different, but not so different that a speaker of modern Greek cannot read — again with some difficulty — the old Greek text of the New Testament. So for the sake of simplicity, we can say that the language of Russian icons is Church Slavic, and the language of Greek icons is old Greek. I have deliberately been a bit vague about what “old Greek” is, because Greek went through several stages of transformation from ancient Classical Greek to modern Greek as spoken by people in their daily lives. I will not include everything one needs to know about inscriptions in this posting, but I hope to expand on what is included here over time, in further postings. First I want to discuss Russian icons. I do this because Russian icons are those one is most likely to encounter, given that they were painted in such huge numbers. And also I must admit to a certain favoritism, regarding Russian icon painting as the real flowering of the icon painting tradition. 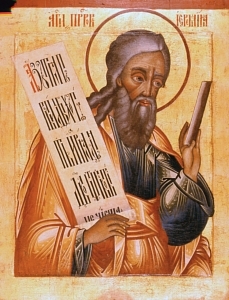 Though the inscriptions on this icon are not clear enough to be easily read in the photo, we can nonetheless use this as an example for learning about icon inscriptions, which on this image are written in red. First, note that there is an inscription at the very top, in the center of the border area. The border — at either top or bottom — is the usual place for the title of the icon as a whole, or the title of the main image on an icon. In this case it is Tsar Tsarem —The King of Kings. That is a title applied to Christ in icons showing him crowned and seated on a throne as Tsar — as Emperor or “King.” The Russian and Church Slavic title “Tsar,” by the way, comes from the Latin word Caesar. So now we have covered the two basic kinds of general icon inscriptions — the overall title of the icon, and the individual names of the saints depicted. Often, however, we will see additional inscriptions. On some, it may be writing on a scroll held by a saint. On others, as in this example, it will be something else. In this case it is on the two discs held by the two angels. The one on the left reads ΙС; the one on the right reads ХС; together — I S KH S –They abbreviate Iesous Khristos, “Jesus Christ,” which abbreviation is often written the same in both old Greek and in Church Slavic. On State Church icons of the middle of the 17th century onward, one will find this abbreviation given as IHC XC — IIS KHS — adding an additional letter to “Jesus” as part of the change in the Russian liturgical books essentially forced on the Russian Church by the Patriarch Nikon, its head at that time. Nikon’s “reforms” led to the separation of the Old Believers, who kept to the old forms and rites and detested such changes. It is important to note that the Old Believers were terribly persecuted by the State Church — the mainstream Russian Orthodox Church, by means of the Russian State, which acted as its punishing arm. Many of them died rather than give up what they considered to be the true faith and practice handed down to them by their forefathers. But getting back to the matter of inscriptions, we have now covered all of them present in this icon, and we have seen the general pattern followed by inscriptions on Russian icons — the overall title, the secondary names of the saints pictured, and the tertiary additional inscriptions. However, note that in this example Mary wears a crown, which is absent in the standard Deisis. That is why this particular form is often called “The Queen Stood at Your Right” (Predsta Tsaritsa Odesnuyu Tebe). That is an Old Testament excerpt from Psalm 45:9 (44:10 in the Church Slavic Bible): “Upon your right the Queen did Stand in Gold of Ophir.” Sometimes in this “Queen” variant, both the crowned Mary and John the Forerunner are shown winged, like angels. Also noteworthy is that in some versions Jesus wears a bishop’s crown (mitre) rather than the crown of an emperor or tsar. Now we have covered almost everything, but should also note that Jesus holds a long sceptre and the book of the Gospels, which in this example is closed. And finally, in the three bars of the cross that almost always are visible in the halo of Jesus in Russian icons, we see the letters O ΩΝ (Ho On with the “o” pronounced like the o in “lo,” but written on most Russian icons in a Slavicized form, as in this photo, instead of the modern Greek form). It means “The One (Ho) Who Is (On),” the name of God revealed to Moses in the Old Testament, translated in the King James version as “I Am That I Am.” That is to indicate that, in keeping with Eastern Orthodox belief, Christ is also God. I will also caution you that in addition to these two main languages for icon inscriptions, one may also find occasional additional inscriptions — generally added notes rather than main inscriptions — written in “modern” Russian on Russian icons, and additional inscriptions in more modern Greek on Greek icons. In the case of Russian icons such inscriptions often say when and for whom an icon was painted, or why it might have been given as a donation, or perhaps indicating some other event commemorated. If you are a beginning student of the art of icons, do not forget to learn the Cyrillic alphabet so that you may decipher the originals of these inscriptions on Russian icons. And you will also need to know the Greek alphabet for Greek icons. There are little variations in the manner in which both Cyrillic and Greek letters are written on icons, and I will try to deal with those in future articles. And also in future articles, I will devote more time to Greek icons and how to read them. I do not want to end this posting without mentioning that among the icons produced by other countries in which Eastern Orthodoxy is found, there are the icons of the Romanian Orthodox Church. The old examples may have inscriptions in Cyrillic script, but more recent Romanian icons are generally inscribed in Roman letters (Romanian is predominantly a “Latin” language with Slavic influence, in contrast with Russian, which is Slavic). Perhaps I will have more to say about Romanian icons in articles to come. They are seldom seen outside of Romania in comparison to Russian icons, and when they are seen it is often in the “folk” form, which was as reverse paintings on glass, set into in a wooden frame.